Safety of Long-Term PPI Use | The Medical Letter, Inc. Mechanism – Reduced gastric acidity might interfere with calcium absorption. Clinical Studies – A meta-analysis of 18 trials involving a total of 244,109 fracture cases found that PPI use was associated with a modest increase in the risk of hip (RR 1.26), spine (RR 1.58), and any-site fractures (RR 1.33). Fracture risk was similar with short-term (<1 year) and longer use.8 A prospective cohort study that followed 9423 patients for 10 years found, after controlling for multiple risk factors, that PPI use was associated with a shorter time to a first nontraumatic fracture (HR 1.75).9 However, a prospective cohort study including 79,899 postmenopausal women from the Nurses' Health Study found, after adjustment for confounding variables, no significant association between PPI use and fracture risk.10 No association between PPI use and osteoporosis has been demonstrated. KIDNEY DISEASE — Use of PPIs has been associated rarely with acute interstitial nephritis and subsequent progression to chronic kidney disease (CKD).19 Recent observational studies have reported an increased risk of CKD without acute kidney injury in long-term PPI users. Mechanism – The mechanism by which PPIs might cause CKD is unknown. Mechanism – Release of vitamin B12 from dietary protein is dependent on gastric acid. IRON DEFICIENCY — Use of PPIs can inhibit iron absorption, but the clinical significance of this effect is unclear. COMMUNITY-ACQUIRED PNEUMONIA (CAP) — Use of PPIs has been associated with a small increase in the risk of CAP, but the results of studies are conflicting. Mechanism – The exact mechanism by which PPIs might increase the risk of CAP is not known. Reduced gastric acidity might promote bacterial colonization in the upper GI tract. CDI — Recent studies of an association between PPI use and an increased risk of Clostridium difficile infection (CDI) have produced conflicting results. Mechanism – Whether acid suppression increases the risk of bacterial gastroenteritis and CDI is controversial. Reduced gastric acidity may promote bacterial colonization and increase the ability of C. difficile spores to convert to the vegetative form and survive in the lumen of the GI tract. DEMENTIA — PPI use has been associated with cognitive decline, but a causal relationship has not been established and the evidence to date is limited. CONCLUSION — Long-term PPI use has been associated with an increasing number of safety concerns. Few of these concerns are supported by a causal relationship or consistent data. For patients with a clear indication for long-term treatment with a PPI, the benefits probably outweigh the risks. 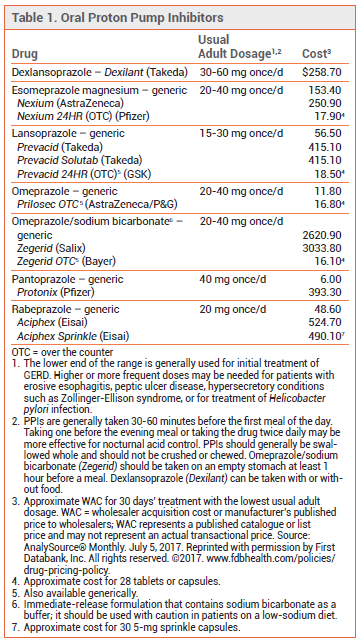 Drugs for peptic ulcer disease and GERD. Treat Guidel Med Lett 2014; 12:25. LH Eusebi et al. Proton pump inhibitors: risks of long-term use. J Gastroenterol Hepatol 2017; 32:1295. B Farrell et al. Deprescribing proton pump inhibitors: evidence-based clinical practice guideline. Can Fam Physician 2017; 63:354. PPIs and fracture risk. Med Lett Drugs Ther 2013; 55:15. Zhou et al. Proton-pump inhibitors and risk of fractures: an update meta-analysis. Osteoporos Int 2016; 27:339. LA Fraser et al. The effect of proton pump inhibitors on fracture risk: report from the Canadian Multicenter Osteoporosis Study. Osteoporos Int 2012 Aug 12 (epub). H Khalili et al. Use of proton pump inhibitors and risk of hip fracture in relation to dietary and lifestyle factors: a prospective cohort study. BMJ 2012; 344:e372. In brief: PPIs and hypomagnesemia. Med Lett Drugs Ther 2011; 53:25. EJ Hoorn et al. A case series of proton pump inhibitor-induced hypomagnesemia. Am J Kidney Dis 2010; 56:112. BA Hansen and Ø Bruserud. Hypomagnesemia as a potentially life-threatening adverse effect of omeprazole. Oxf Med Case Reports 2016; 2016:147. In brief: PPIs and torsades de pointes. Med Lett Drugs Ther 2016; 58:153. H Asajima et al. Lansoprazole precipitated QT prolongation and torsade de pointes associated with disopyramide. Eur J Clin Pharmacol 2012; 68:331. JN Bibawy et al. Pantoprazole (proton pump inhibitor) contributing to torsades de pointes storm. Circ Arrhythm Electrophysiol 2013; 6:e17. JH William and J Danziger. Proton-pump inhibitor-induced hypomagnesemia: current research and proposed mechanisms. World J Nephrol 2016; 5:152. W Cheungpasitporn et al. Proton pump inhibitors linked to hypomagnesemia: a systematic review and meta-analysis of observational studies. Ren Fail 2015; 37:1237. T Antoniou et al. Proton pump inhibitors and the risk of acute kidney injury in older patients: a population-based cohort study. CMAJ Open 2015; 3:e166. B Lazarus et al. Proton pump inhibitor use and the risk of chronic kidney disease. JAMA Intern Med 2016; 176:238. DCF Klatte et al. Association between proton pump inhibitor use and risk of progression of chronic kidney disease. Gastroenterology 2017 June 2 (epub). Y Xie et al. Long-term kidney outcomes among users of proton pump inhibitors without intervening acute kidney injury. Kidney Int 2017; 91:1482. L Linder et al. Drug-induced vitamin B12 deficiency: a focus on proton pump inhibitors and histamine-2 antagonists. J Pharm Pract 2016 Aug 12 (epub). JR Lam et al. Proton pump inhibitor and histamine 2 receptor antagonist use and iron deficiency. Gastroenterology 2017; 152:821. C Giuliano et al. Are proton pump inhibitors associated with the development of community acquired pneumonia? A meta-analysis. Expert Rev Clin Pharmacol 2012; 5:337. M Sarkar et al. Proton-pump inhibitor use and the risk for community-acquired pneumonia. Ann Intern Med 2008; 149:391. KB Filion et al. Proton pump inhibitors and the risk of hospitalisation for community-acquired pneumonia: replicated cohort studies with meta-analysis. Gut 2014; 63:552. S Khanna et al. Gastric acid suppression and outcomes in Clostridium difficile infection: a population-based study. Mayo Clin Proc 2012; 87:636. AD Leonard et al. Proton pump inhibitors and diarrhoea related to Clostridium difficile infection in hospitalized patients: a case-controlled study. Intern Med J 2012; 42:591. CS Kwok et al. Risk of Clostridium difficile infection with acid suppressing drugs and antibiotics: a meta-analysis. Am J Gastroenterol 2012; 107:1011. A Vogiatzoglou et al. Cognitive function in an elderly population: interaction between vitamin B12 status, depression, and apolipoprotein E ε4: the Hordaland Homocysteine Study. Psychosom Med 2013; 75:20. N Badiola et al. The proton-pump inhibitor lansoprazole enhances amyloid beta production. PLoS One 2013; 8:e58837. W Gomm et al. Association of proton pump inhibitors with the risk of dementia: a pharmacoepidemiological claims data analysis. JAMA Neurol 2016; 73:410. P Lochhead et al. Association between proton pump inhibitor use and cognitive function in women. Gastroenterology 2017 July 18 (epub). Y Xie et al. Risk of death among users of proton pump inhibitors: a longitudinal observational cohort study of United States veterans. BMJ Open 2017; 7:e015735.